With being off on holiday this week I have been quite successful with retrogaming pick-ups from Cash Coverters, CEX and Facebook. 1. Facebook – I saw this on a Facebook gaming page and could not resist the purchase, Gameboy Flappy Bird ROM cartridge. 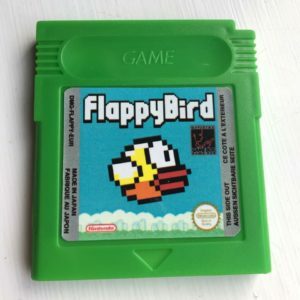 If you thought the game was hard on your phone it’s even more difficult on a Gameboy. The best console to use it on is a Color and so far i have had about half an hour on it and scored a maximum of 2. No that is not a typo, only 2. I will get back on to it very soon! The quality of the labelling is fantastic and will be buying off this guy again as he produces more games. How great is it that someone devotes time to producing new games for such and old console! 2. 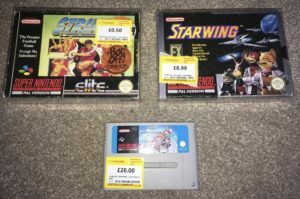 Cash Converters – I popped into my local Cash Converters and picked up this nice bundle of SNES games. Didn’t really need Starwing but as it rare to see SNES games in local shops I couldn’t say no. Striker at 50p looked like a pricing error and was worth it even if just for the protective case which went straight onto my box Zelda N64 game when I got home. The best buy was definitely Super Mario Kart so this weekend it will be time to dust off the SNES and boot it up. 3. CEX Thetford – there was quite a selection of retro games on my visit there this week including a boxed Zelda Ocarina of Time N64 game, Gameboy Color and Gameboy Advance consoles, numerous PS1 games plus Game Gear and Gameboy games. 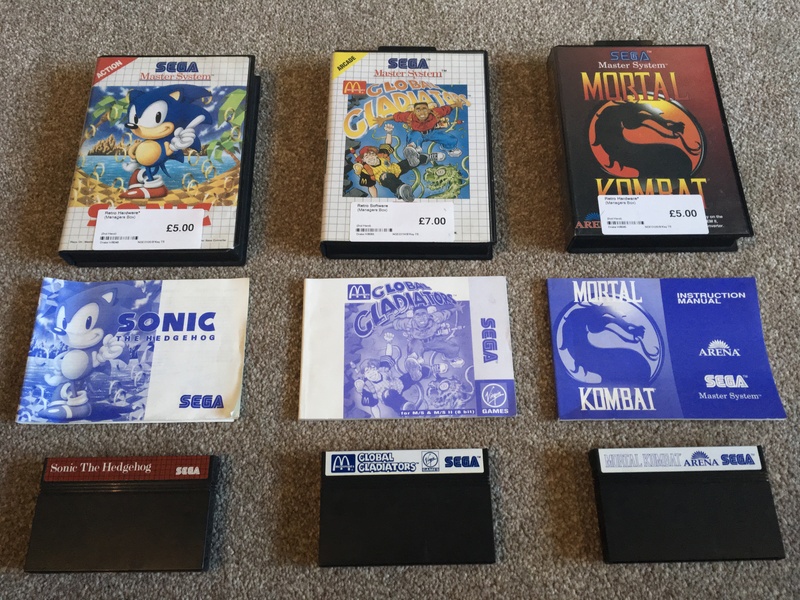 I settled for these three Sega Master System games. Again it is rare to find them in such great condition in a local shop. They are nice additions to the collection, even Sonic that is in much better condition than the one I have already. Will look forward to testing these games and sharing my views on them. 4. CEX Cambridge – As I went to Cambridge Christmas shopping with the other half how could I not resist popping into my second CEX of the week and boy was I pleased! There were a few ropey boxed N64 games including the second N64 Zelda of the week plus some near mint items. One of these near mint N64 games I managed to persuade the other half to pick me up for Christmas so I will share that on the grand day as it would be wrong for me to talk about it before I unwrap it! Does this mean she is coming around to my hobby? Nah I doubt it! The one item I settled for was a GBA NES Classics The Legend of Zelda. As you can see from the photo it is in fantastic condition so another great addition to the collection. I am also pleased to have replace the game when I have only just sold my only loose copy to a Twitter friend this week. All in all it was a good week for additions to the collection. It also shows just how much the price of retro games has increased over the last few years with collecting them becoming more popular. Great for sellers but not for us collectors. Just before writing this article I have purchased three boxed Gameboy games from a Facebook gaming selling page. So watch out next week when I will share the details of these games. Please let me know what you think of these purchases and let me know how successfully you have been at CEX and / or Cash Converter stores. Excellent! I’m never this lucky when looking in my local CeX. Altho they have started doing GBA games and as its the system I’m collecting for I look there. Unfortunately they only have Boktai so hoping they get more in. I find it’s worth just popping into these places on occasions as you never know what and when they will have stuff. 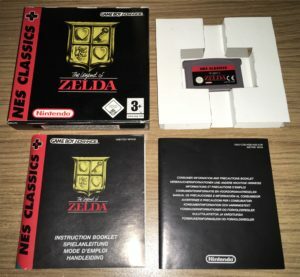 Interestingly the guy at CEX told me all store retro stock is listed on their website so may be worth taking a look there but not sure they always have photos!! Thanks for taking the time to comment. I will email the guys Facebook name and group it was on, hopefully you will be able to search for him.